People smile when I tell them “Do today what you can do tomorrow,” but this is how I motivate myself to do things ahead if I have a little extra time on my hands. Let’s say I have scheduled a particular task – laundry or ironing, for Wednesday, but realized that I have time to do it on Tuesday, what is stopping me from doing it earlier than previously planned? Nothing. And believe it or not, I really do it right away, before my mind even gets to invent ten reasons why I shouldn’t do it a day ahead. Nothing “bad” would happen if I kept my schedule, but I know that I would not have to “postpone” anything if something unexpected came up on Wednesday. 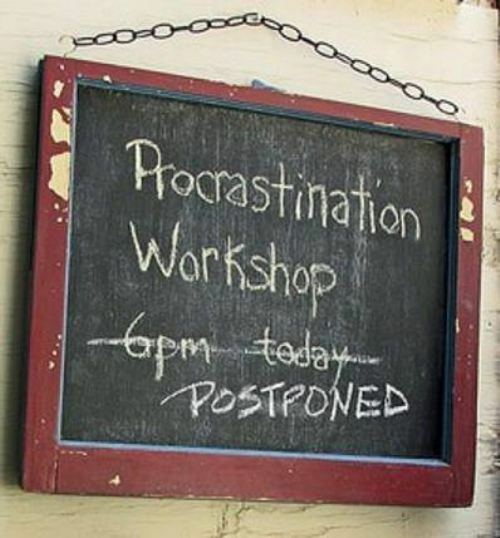 Everybody procrastinates, but not all of us are notorious procrastinators. However, some people procrastinate out of habit. They have mastered the delaying tactics. They would invent countless “important” reasons to delay, postpone or even not to do what they, sometimes urgently, must do at particular time, and they would persuade themselves that these “inventions” are not only true, but also pivotal. Procrastination is a self-defeating behavior. When we procrastinate we do not “cheat” others of their success, we sabotage our own. So what if not even a terrifying vision of failure would stop us from procrastination? What if we have faced embarrassment before and the world did not end? Maybe a vision of failure is not enough to prevent us from postponing important tasks. Maybe we have to fail completely to change our ways. Some people believe that they function better under stress and this my be true for them, but most of us fail to produce high quality results when we do things in the last minute before the deadline. Unfortunately there is not pill or potion that can be taken to cure procrastination. But since procrastination is a learned behavior it can be unlearned, although it may take a little more than introspection to find out why you procrastinate. Notorious procrastinators may need professional help of a success coach, but most of us can easily master the habit of now. It is said that it takes twenty eight days to develop a habit – good or bad. To unlearn a bad habit one simply must consciously and rigorously reinforce the new behavior. This should not be too difficult when you consider that doing things on time will make your life less stressful. With all the fear of failure gone, your life will be much more enjoyable and you will have more time and energy to do so many other things.